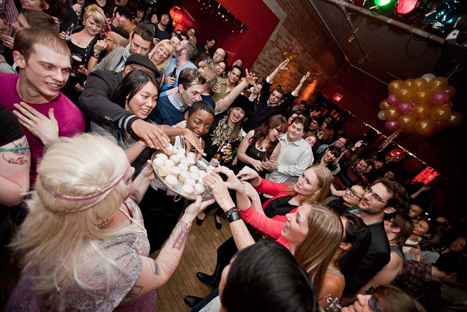 Gladstone Hotel’s 5th Anniversary Party! One of my favorite places in the city is the Gladstone Hotel. I love putting on events in the Ballroom, I love showing people the gallery spaces, I love popping in occasionally for karaoke in the Melody Bar, and of course I love the artist designed rooms. It is an amazing cultural hub that I’m lucky to have in my neighbourhood. Five years ago it officially had it’s rebirth as a boutique art hotel. It’s been a family run hotel for 122 years! On Friday the 21st they had a huge bash and I was lucky to be a part of it. First Miss Fluffy Souffle cruised and shmoozed the community partners event. Then I (Kaleb) got to host the show in the Ballroom and introduce the fine ladies of Skin Tight Outta Sight. At midnight after yet another room giveaway, Miss Fluffy Souffle took to the stage in front of a huge crowd and entertained them with a special new medley of songs. 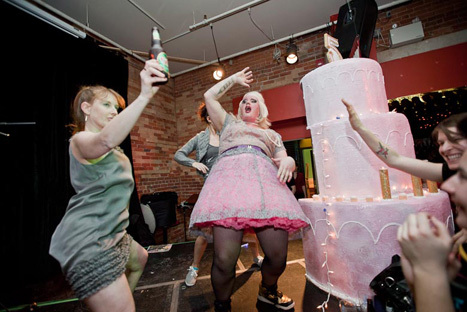 I got to emerge from a 6′ tall gorgeous pink glittery cake that was made by Trixie and Beever (http://www.trixieandbeever.com/). I was joined onstage by two members of my favorite dance troupe, JAT, looking foxy as ever. After chugging a bottle of 50 (to 50 Cent’s “In Da Club”) I took to the floor with a tray of mini cupcakes. It was like people had never seen cupcakes before, they were so excited. It was amazing! Managed to work my way to the Cafe bar and hopped up on it. Did some air guitar up there to the Beatles “Birthday” before shoving through the crowd to get back on stage and finish up the number. So much fun and the crowd was great! More are posted on the Gladstone’s Facebook page, or become friends with Fluffy on Facebook! This entry was posted on Tuesday, January 25th, 2011 at 9:51 am. It is filed under Miss Fluffy Souffle, Recent Blog Posts, Uncategorized. You can follow any responses to this entry through the RSS 2.0 feed.